Self Contained Studio close to Lake and Town! Our Self contained private access studio has everything you need and it is perfectly located for Business or pleasure! It’s a short walk to the Lake and Taupo’s wonderful eateries and bars. Or stay in and cook on the gas bbq on the deck in a garden area. You can purchase a very good NZ wine and a steak from the local butcher and supermarket only 5minutes walk from the studio! We also welcome those from the LGBT community. Taupo is a magnificent Tourist Town situated in the central North Island nestled next to beautiful Lake Taupo, New Zealand’s largest lake. She offers fabulous Geothermal Walkways, Huka Falls, Hot pools, De Bretts Baths, Mountain Biking tracks, Hiking Tracks, Kayaking, Fishing, Jet Boating, Bungy Jumping and more. Taupo hosts these major events: Ultra marathon, Kellogs Nutri-grain Iron man, lake Taupo cycle challenge, All Women’s Adventure Race, NZ Offshore Powerboat Championship, Taupo Summer concert – 2017 Icehouse, Alan Parsons. Only 2 hours drive from the incredibly picturesque Central Plateau Ski Slopes! Taupo is perfectly located for most activities and provides a great stop over as you tour through the North Island of New Zealand. Whether it is snow boarding, skiing ,Kayaking, Hiking, Marathons, cycling ,or site seeing we have it all! We truly hope to see you soon. * No smoking.We are a smoke free home. * BBQ to be cleaned and covered after use. Suitable for couples and friends. We're not suited to small children under 12yrs. This is a quite, close-knit neighborhood. We ask that you respect the neighbours andamp; us when entertaining or using the outside area. We live on the property upstairs and only ever interact with our guests if they want to connect with us. Heather is a 'homegrown' Kiwi born in NZ and Louise is originally from Zimbabwe. We are both fabulous cooks, in our own humble opinion and love to celebrate with good food and a glass of wine on occasions. Heather is a seasoned Trip Leader and Louise is an international Channel working online with clients world over. We purchased the home in March of 2016 from Heather's parents. It has long been used as a holiday home for family and friends. We decided to renovate the studio downstairs and share the space with others. Being so close to the town, lake and other places of interest we felt it would be fun to have others experience what we have on a daily basis. toilet, shower, Bathroom has a shower, hand basin & toilet. The Shower has great hot water flow pressure. We supply a convection heater, and there is the use of a dehumidifier as well when the temp drops to the negatives - a combination use of both heats the studio up nicely. The bed comes ready made with fresh linen and duvet/pillow cover. Free Unlimited WiFi - please do not download movies as this does slow things down. Bath, hand and face towels provided for your convience. A fabulous fridge small enough to out of the way but big enough to hold milk, veggies, wine, cheese and has a small ice box for small frozen items. Benchtop Oven - great for cooking a full roast dinner or grilling a cheese sandwich. Big enough for meals and dishes. Loads of power and easy to use. We supply a few items - tea, coffee, freshly ground coffee and a cereal to ensure you have something when you arrive if you haven't got to the shops first. Dishwashing liquid is under the sink. You will find the pots, pans, boards, knives and other bits that make a good working kitchen in the cupboards. As well as crockery and cutlery, coffee mugs, tea cups etc. Dining Table and Chairs. plenty of room for your laptop while using the free WiFi. We have a small library of reading matter - please don't take this with you or if you want to exchange 'one for one' you are welcome to do that. There is a deck outside the living area that you can sit and enjoy a quiet wine/coffee and watch the day go by. Guests are invited, if they choose, to contact Louise if they wish to have a therapeutic massage during their stay. If you are looking for ideas of what to do while in Taupo, once a confirmed booking is made they can reach out to Heather, who is a seasoned Trip Leader. Once she knows your 'must do's', 'hope to do's', and 'wants to do', while here, Heather can create an itinerary and book the required things so that you can pick up and go when you arrive. This a service we give free of charge to our guests. 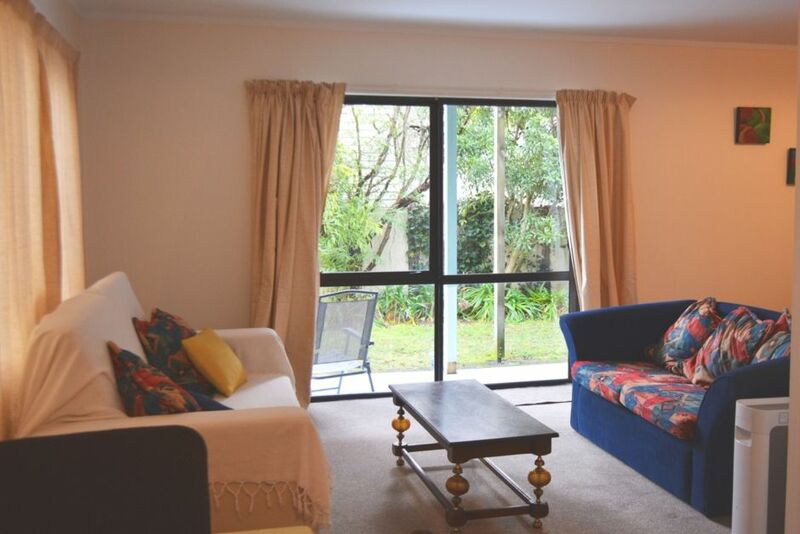 The studio was perfectly furnished for a comfy and cozy stay very close to Taupo and activities surrounding. William and his partner were wonderful guests and we welcome them back anytime. This was just a quick stay but the room was clean and tidy. The upstairs house is very noisy when people move around up there. We could hear every footstep as it creaked loudly downstairs. Apart from that it’s great. Thank you for staying . You and your family are welcome any time. Very nice comfortable studio within walking distance to all of the town's activities. Great hostess --- thank you for all you did to make us comfortable and taking time to talk with us about things to do during the rest of our New Zealand trip. Call us any time you're in the States. Great location - walking distance to town if you like walking or short car drive. Great location - walking distance to town if you like walking or short car drive. Close to local shops. Very clean with everything you need including washing machine. And it was so quiet and peaceful which was just what we needed. We are in the Central North Island, which allows you to access the powerful Geothermal activity sites. Found in and around Taupo and Rotorua. The Ski Fields - are approx 1hr 15min drive from Taupo. Even if you don't ski this is a wonderful place to view some magnificent sites and is a photographers dream. As our Guest we would like to offer you a free itinerary service. You are in luck - Heather is a seasoned and very experienced Tour Director and has been involved in the industry for many years. Maybe you are wondering what the best things to see and do in the Taupo, Waikato region are, based on your interests and wish list? If so let us know.